Charminar and Salarr Jung Museum were on our list for months. Once we had planned but it got cancelled. Third week of November I promised Pushpa to take her that weekend. We left home by 9-20 AM, our plan was to see Charminar first and then spend rest of the day at Salar Jung Museum. Instead of taking Panjagutta route we took Mehdipatnam route. As we entered the old city, the streets were narrow, journey was slow. Though we had Google Maps on to navigate us, we would stop and ask people just to be sure. At one stop, a man offered to show us the way since he too was heading the same way. Good, hop in. As we reached the bridge across river Musi with Salar Jung Museum towards our left, time was 10 AM, we changed our plan. We dropped off our guide and went to the museum. We visited all galleries, made sure we saw the main attractions and came out by 4-30 PM. As we walked towards parking area, we checked out the antique fire-fighter truck opposite the museum entrance. 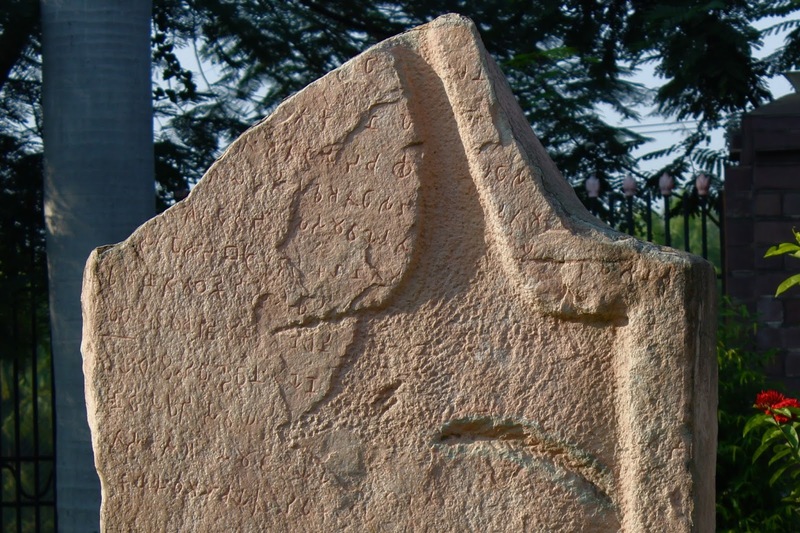 As we continued towards the parking lot a stone monument caught my attention; it had an inscription; the letters were undoubtedly Brahmi. 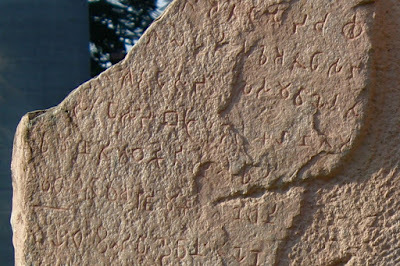 So, where is this inscription from? There was no board around the inscription.. what is it, where is it from, nothing. I took pictures, let me compare the scripts once I reach home. 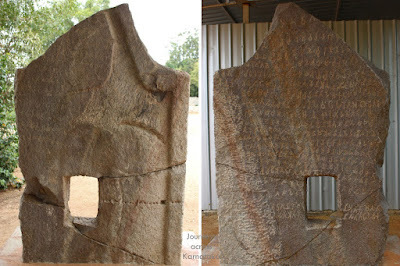 On checking the pictures in the post on Sannati inscription, it was clear the stone was from Sannati. And there's something else too.. I was looking at the inscription after exactly 2 years! What a coincidence!! The coincidence made me happy, something to :) about. So why was this important prehistoric inscription brought to Salar Jung Museum? 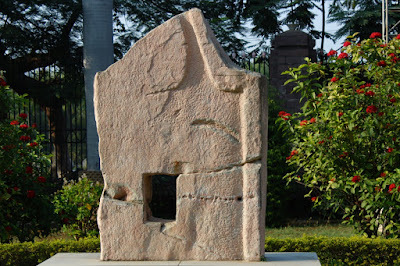 And that too its been put on display without even a name board to it, out in the open, not even a shelter to shield it from sunlight and rain. The original block with the Brahmi inscription was broken and used as a pedestal for the deity at Sri Chandrala Parameshwari temple, Sannati. Into the square hole fits in the deity's base. A closer look at the inscription. 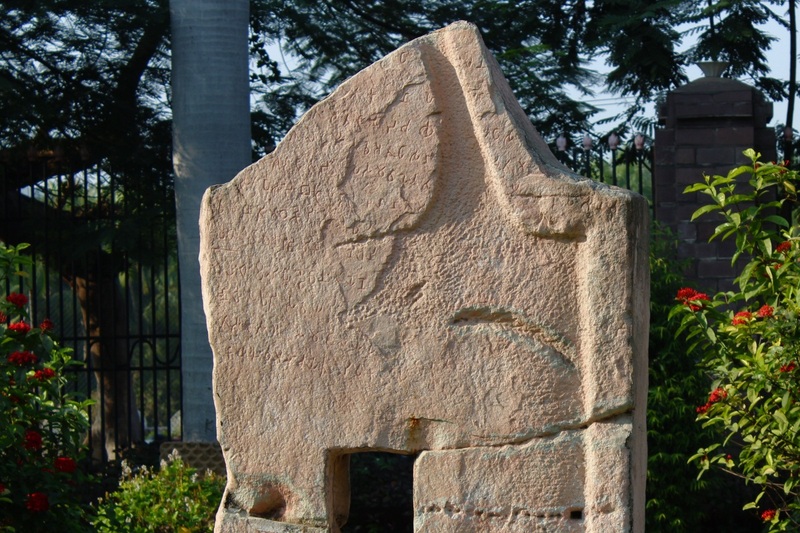 If this stone remains exposed to sunlight, dust, smoke and rain, it won't be long before the letters fade away. It needs to be kept in a shelter, preferably indoor. Perhaps I must reach out to ASI with a request to move it back to Sannati and remain at its original location. 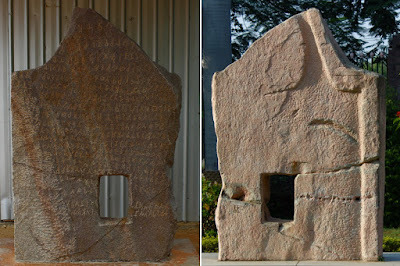 To know more about Karnataka's edicts check out The nine rock edicts of Samrat Ashoka in Karnataka.